Sedation dentistry is a treatment option for surgical cases and for anxious patients who generally avoid the dentist. Conscious sedation, which helps patients relax and feel comfortable during procedures, is the form most often used. In some cases full anesthesia may be used. Dr. Derik Alexanians is one of the leading IV sedation dentists in California and is a highly skilled general dentist with postgraduate training in all aspects of dentistry. Having performed over a thousand cases involving IV sedation, Dr. Alexanians is among a small number of dentists who routinely employ moderate IV sedation as a treatment option. Dr. Alexanians is committed to providing the gentlest of care to all his patients, and he wants everyone who needs dental care to feel comfortable receiving it. He works with patients who have previously avoided the dentist due to a variety of fears, to relax and feel at ease during treatment. Dr. Derik Alexanians is one of the leading IV sedation dentists in California. Also known as twilight sleep, IV sedation is administered to help lose your anxiety and feel less discomfort during a procedure. You’ll fall into a state of deep relaxation, yet remain conscious, and you’ll be able to both understand and respond to requests from your doctor. IV sedation is our preferred method of sedation for longer procedures. IV sedation gives us a little more control over regulating your comfort and makes it possible to provide more treatment in one visit. The sedative is flushed out at the end of your procedure, so you can expect a fast recovery time. Sometimes a small pill can make a big difference in the way you feel during a dental procedure. Oral sedation can help you feel quite calm and serene, while being completely awake. You won’t feel any discomfort and can communicate with us at any time. We closely monitor you during any type of sedation to ensure the proper dosage and your complete comfort. When patients have certain medical conditions, a high tolerance to sedatives, or are extremely anxious about receiving treatment, our associate medical anesthesiologist, Dr. Yarian provides general anesthesia. 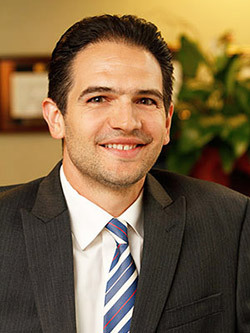 As an anesthesiologist, Dr. Yarian uses medications that are beyond the scope of sedation dentistry. Unlike IV and oral sedation, patients requiring general anesthesia are completely asleep and have little or no recollection of undergoing treatment.